Habitat: Desert (low elevation). This frost-sensitive plant grows in sandy desert washes and on rocky slopes. Flowering Season: Spring, Summer, Fall. It blooms heavily in the springtime and then again lightly and sporadically throughout much of the year if conditions are right. Description: The flowers are tubular, 1 2/3 inches (4 cm) long, and have a 2-lobed upper lip and a narrow, 3-lobed lower lip. The leaves are green, fuzzy, opposite, and rounded, triangular, or egg-shaped. 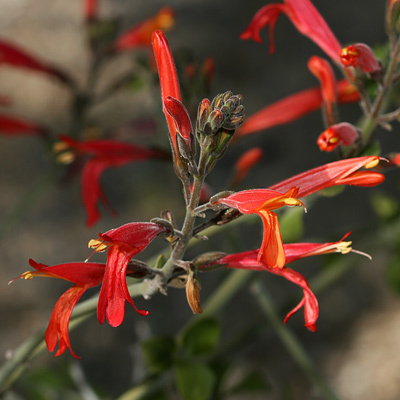 The plants are cold and drought deciduous and are usually leafless. The stems are covered in dense, fine, grayish hairs. 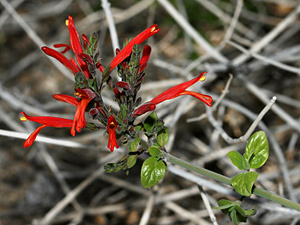 The similar Arizona Water-willow (Justicia candicans) has upright flowers with a broader lower lip that has white markings at its base. Edible – The flowers are edible either raw or cooked.